-DEBUTING TIGER DRILL ISSUE 2: ROAD JERKS AHEAD! -Tigerdrill #1 will obviously be available and is also OBVIOUSLY required reading ya mook. 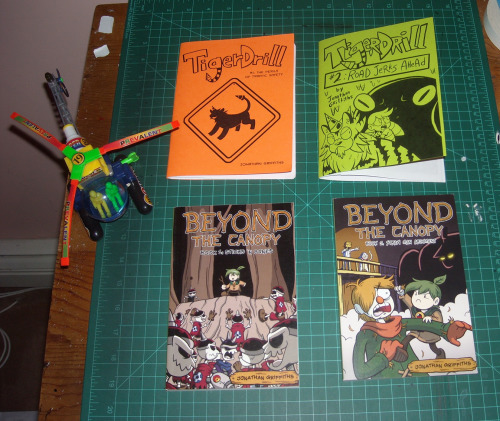 -Beyond the Canopy Books 1 and 2! In addition to regular copies I’ll have a few messed up copies (bent edges, some slight formatting errors but still completely readable) available for $5 each! I only have like, 3 or 4 of those though so if you’re interested in some CHEAP STUFF I have those. -SKETCH CARDS! What I have in the second pic are just examples, but I’ll have a booklet full of ones for sale and also I’ll do sketch card commissions! -MONSTER GIRLS PRINT. PICK IT UP FOR HALLOWEEN. OR ELSE. ALSO NOT SHOWN: I’ll have BtC pins, some leftover ground hound charms, and a few stray copies of Business Snails floating around! 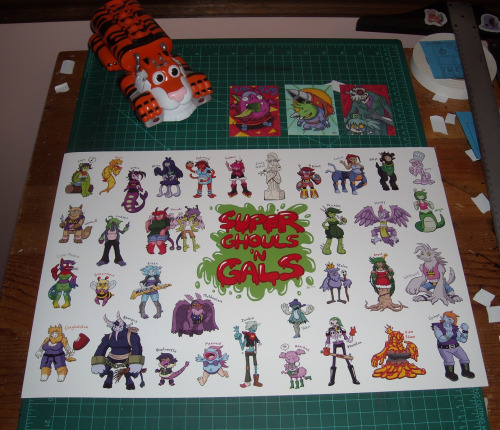 Also, the Tiger Tanker and the Super Queer 19 Copter will be on hand for moral support. COME ON BY! Jon makes some of the funnest comics you can read. If you’re in the Bethesda, MD area this weekend go to SPX (http://spxpo.com) and buy them all. via my Tumblr, which you should check out.